Hello once again, fellow spacers! Welcome to another week of Force Lore. This week you get a double dose of Force Lore, first with this regular column and an additional Special Valentine’s Day Edition. Hop on back to the main page of CCR and check out the other article when you’re done here. Last week we looked into the history of Tython, the Jedi Consular and Jedi Knight starting world. It was a fair bit on the “Light Side”, pun intended. This week, we’re going to take a trip to the Outer Rim, to a world of evil spirits and dark treasures. There aren’t too many worlds within the Star Wars galaxy that are darker than Korriban. That’s where we’re headed. Strap in, power up your shields, and let’s get those coordinates from the Astromech for the navicomputer. The Outer Rim regions of the galaxy host a great many worlds of wonder and mysticism. The perfect choice for the starting area for the Sith Warrior and Sith Inquisitor went to the world with, perhaps, the darkest legacy of all: Korriban. This desolate and unforgiving world is primed for conditioning up-and-coming bad boys and girls to do the Sith Empire’s bidding. Located in the Horuset system in the Esstran Sector, the mountainous, red-dust and rock planet has been the center of Sith ideology and beliefs since the early history of the group. Korriban is the first world in SWTOR that I stepped foot on, virtual-speaking. Was I disappointed? Not in the least bit. Desolate and hard, just what I had imagined it to be. Crumbling ruins and barren sands lead on to the resting spots of many powerful Force-users. The one complaint I did have was that Korriban was brightly lit. I guess in my mind, the world where the Sith got their start should be a tad on the darker side. But overall, wow. The story arcs and NPCs your character interacts with let you know just how down right evil this place is. Not to mention that it has made it’s fair share of people evil too. Starting way back in the history of the galaxy, the original red-skinned species known as the Sith dwelt on the planet Korriban. Located in the Stygian Caldera region of the Outer Rim, this arid world was somewhat isolated from other parts of the populated galaxy by a nebulous cloud effect that surrounds the region. It is far easier to access the caldera from the outside than to break out from the inside. Korriban can be found at the end of the Daragon Trail hyperspace route, a travel lane that starts at Koros Major and terminates at Korriban. For thousands of years before the founding of the Republic, the Sith would live in an isolated society developing their sophisticated, somewhat archaic caste society, blending dark sorcery and alchemy with their spiritual beliefs. At some point during the Sith’s early history, the Killiks had a nest on Korriban which led to a Killik Sith lord coming about. Then came the Rakata, attempting to add Korriban to their Infinite Empire. The Sith resisted this takeover, forcing the Rakata off their world and obtaining captured ships and technology. Using the hyperspace-capable ships of the Infinite Empire, the Sith spread to other worlds, eventually relocating their homeworld to the planet Zoist. Korriban was left populated with religious fanatics and the dregs of the Sith society. Korriban became no more than a tomeworld for the Sith as their society deteriorated into a leaderless, feudal state. Xim the Despot would conquer Korriban around 25,126 BBY and it would remain part of his empire until he was overthrown. During this time, Korriban was known as Pesegam. Many millennia would go by before Korriban would come into prominence again. Dark Jedi that were exiled from the Republic following the Hundred Years of Darkness eventually came across Korriban and the Sith. These Jedi quickly subjugated the natives and began building an empire. This was the beginning of the Golden Age of the Sith. 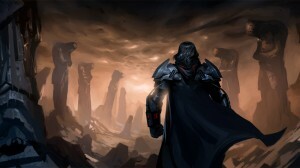 From 6900 BBY to 5000 BBY, the Sith Empire grew and developed into the Dark Side driven faction it is in SWTOR. The Dark Jedi, led by Ajunta Pall, intermingled with the native Sith, cross-breeding with them and delving into the dark arts of the Dark Side of the Force. The use of Lightsabers and training in the Force mixed with the alchemy of this old, archaic culture. As I discussed in the first installment of Force Lore, the explorers Jori and Gav Daragon would stumble onto the Sith Empire about the time of Marka Ragnos’ death. Led by the enigmatic Naga Sadow, the Sith Empire ventured off of Korriban and their other worlds to conquer the Galactic Republic. The Sith were defeated by the Republic, Jedi, and in-fighting between rivals of Sadow. This led to Korriban being all but abandoned for centuries until survivors of the Great Sith War resettled there. This conflict goes by many names: The Exar Kun War, Sith War, and the largest engagement of the Old Sith Wars. Dark Jedi, once again, in exile, founded the settlement of Dreshdae and the Sith Academy. Dreshdae was a sort of capital for Korriban for many years, up until the Jedi Civil War brought on by Darth Revan and Darth Malek. Dreshdae was a port city which was also the location of the tavern, The Drunk Side. The settlement was ripe with seedy activity and most agents of the underworld that associated with the Sith could be found there. Could we see this city resurface in SWTOR? Possible. The rise of the Brotherhood of Darkness in 1006 BBY, prior to the formation of the new Sith Order with the Rule of Two, found Dreshdae as the only inhabited place left on the planet. Dreshdae does have connections to the Knights of the Old Republic series, so it may make it’s way into TOR sometime in the future, if Korriban is expanded upon. In 3956 BBY, the Sith on Korriban descended into their own civil war, which nearly wiped out the population on the world during this time. The Republic would send an expeditionary force to Korriban to guard against any who would attempt to rise up and take the title of Dark Lord again and bring chaos to the galaxy. This would lead up to the time of the Great Galactic War. If you’ve played through Knights of the Old Republic, you will know how Korriban ties into that series of games. I’ll save the details of that for another time, as they deal heavily with the Jedi Revan and his story. During the Republic’s guard on Korriban, the tombs of former Dark Lords saw heavy looting from tome raiders and smugglers looking to profit from the dark treasures locked away on the planet. The smuggler in the TOR cinematic trailer “Return”, Nico Okarr, was busted by Jedi and Republic forces attempting to smuggle Sith artifacts off Korriban. It takes a brave soul to venture to Korriban in order to try and gain a profit by stealing from power-hungry, angry, Sith spirits who want nothing more than to live again and reign terror upon those who wronged them in life. At the start of the Great Galactic War, Korriban was one of the first targets for the Sith Empire to reclaim. As Darth Malgus states in the “Return” trailer, “After a 1000 years… Korriban is ours again!” This is right before he kills Darth Vindican. After slaying his former master, the fitting quote of “Welcome home!” is said. I think it’s safe to say that Vindican probably has a tomb on Korriban, although not as elaborate as Sadow’s or Ragnos’ tomb. Korriban would be used as the training facility for up-and-coming Sith for years following the start of the Great Galactic War. The Sith Academy rivaled the Jedi Temple for training recruits and acolytes for the Empire’s forces. Some of the most notable locations on Korriban are the tombs of the dead Dark Lords. The first you’ll step foot in is none other that the tomb of Ajunta Pall, very fitting that you start your Sith legacy with a trip through the first of the Dark Jedi Sith Lords. The tombs of Marka Ragnos, Tulak Hord, and Naga Sadow are also questing spots you’ll visit. SPOILER: I do want to note that as a Sith Warrior, you are tasked with retrieving an ancient Lightsaber from Naga Sadow’s tomb. When you finally get to the sarcophagus and open it to take the weapon, there is a body in the crypt. THIS IS NOT the body of Naga Sadow. Sadow’s body should be on Yavin IV during this time in the game. Whether this is some patsy’s corpse or a clever trick to scare tomb looters, it’s definitely not the former Dark Lord. The main quest hub is the Sith Academy, an expansive building that rivals the Jedi Temple on Tython. A lot of your quest-givers are here, along with the trainers inside and vendors located just outside. You’ll spend most of your time questing in the tombs with runs back to the Academy to drop off quests and train. There are 3 speeder/public transportation hubs, but you will still do a great deal of running. It’s worth it though. Unfortunately, you only get a glimpse at a small part of this historic planet. What we do know about the future of this world is that around 1000 years before Luke Skywalker destroys the first Death Star, the Sith as we see them in SWTOR are going to face annihilation. 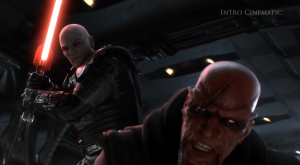 Darth Bane will institute the “Rule of Two”, one master, one apprentice after this disaster. Korriban will still house the tombs of the Sith Lords for years and years to come. But the glory days of the planet won’t return until Darth Krayt forms the One Sith or the New Sith Order during the late Legacy era. Next week we’re going to take a quick break away from the planets to look at a bigger subject other than rocks in space. Until then, may your Lightsaber never fail and may your enemies know no rest. May the Force be with you, as always.